Whatcha Gonna Do If Your Nose Falls Off? Yes, you read that last line correctly. 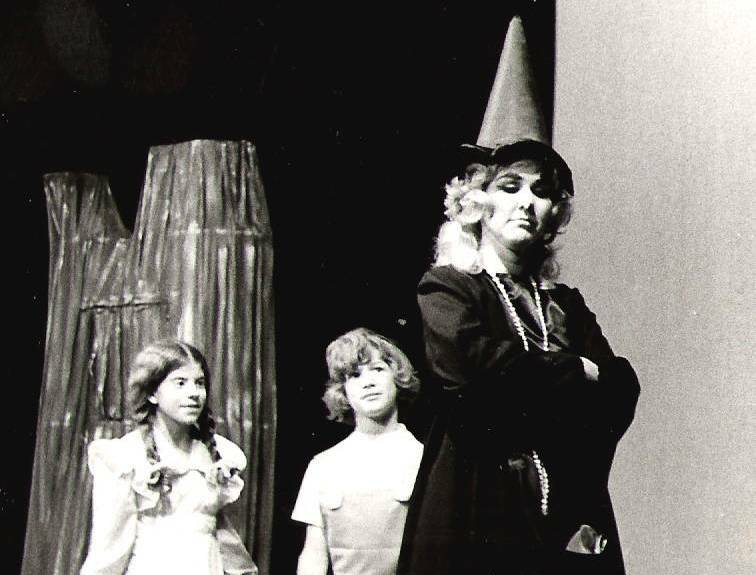 Although an air-borne proboscis reminiscent of Gonzo probably isn’t on anyone’s list of Big Fears, it was certainly at the top of mine back in 1974 when I played the title character in “Annabelle Broom” – a musical about an unhappy witch who disliked wearing black and casting mean-spirited spells. Since she was a comedic character, the role called for me to spend over an hour applying copious layers of nose putty, foundation and powder to simulate one scary-looking beak. As proud as I was of my creation – which seemed to get bigger with each performance – there are certain things you just can’t do while it’s on your face. Sneeze, for instance. Or try to blow your nose, much less wipe away a sniffle. There were also a number of energetic dance numbers and chase scenes over the course of two acts – any of which might cause a prosthetic shnozz to slide off from perspiration or get flattened by someone’s elbow. Every night before a show, I’d stay up late worrying about what I’d do, for I certainly couldn’t hit an audience “pause” button while I ran backstage to make cosmetic repairs. As we approached our closing weekend, I was relieved that my self-inflicted stress would soon be over and I could go back to roles that didn’t require so much time at a dressing table. So there we were in the middle of a soft-shoe number I was doing with my pint-sized co-stars and – as always – I was flawlessly flipping my broom handle back and forth like a vaudeville cane between both hands. Unfortunately, I had underestimated the length of my hooked nose and on one such pass, my face suddenly felt much lighter. I glanced quickly to my right to discover that not only had my fake nose been completely sheared off but – fortunately – it was also still clinging for dear life to the top of the broom. Although this particular scenario was one I had never actually envisioned, I was nonetheless able to spin away from the footlights, hastily stick it back on, and continue dancing. To my surprise, no one even noticed what had happened. So what does any of this have to do with the workaday world? I’m glad you asked. It may not be replete with vengeful sorceresses but there are certainly enough scary realities like our nation’s dismal economy to cause people angst and sleepless nights that the jobs they’ve relied on to support their families could disappear in the blink of an eye. If there’s one thing I’ve learned from theater, however, is that the more energy you put toward rehearsal – including “what if” preparedness – the more confident you’ll feel about being performance-ready in a crisis. Always keep your resume up-to-date, even if you’re not currently looking for another job. If a perfect opening presents itself, you can’t afford to lose valuable time composing a CV from scratch. In my own experience, a chance encounter with a former co-worker at lunch led to the disclosure that her company had an opening which HR was eager to fill. As soon as I got back to work, I faxed over my resume…and was offered the job the following Monday. Create a rainy day fund and contribute to it regularly. (Experts advise having 3-6 months’ salary set aside to deal with any unforeseen breaks in employment.) If saving is a challenge for you, consider an automatic deduction each month through your bank into a separate account; when X amount is regularly taken out before you can ever see it and spend it, saving becomes a painless habit you won’t even think about. Assess your transferable skills. When was the last time you made a list of all the things you know how to do? Are these talents only applicable to your current industry? If you want to go into a different field – or, for that matter, move to a different city or country – what additional skill sets will you need to master? Commit to learning something new at least once a quarter. Is the ax about to fall in your current employment? Whether it’s a product of downsizing, outsourcing, merging or simply trimming costs through layoffs, the first thing you need to do is take a deep breath and remind yourself you’re not the first person to whom this has happened, nor will you be the last. The emotions you’re going to experience – depression, stress, anxiety, fear – are perfectly normal. The key is to focus on the positives in your life. The longer you dwell on regrets, denial, anger, and feelings of failure, the tougher it will be to move forward. Be honest with your loved ones about what’s going on and make it a team effort to get through the rough patches together. Sadly, I recall one of my own relatives who was so upset about being laid-off – but determined to keep up the appearance of normalcy – that he put on a suit every morning and didn’t come back until dinnertime. He kept up this routine for almost a year, pretending that the money he brought home was from his job and not the savings accounts he totally depleted. Confide in people you trust and whose advice your respect. If you let it be known that things aren’t going well career-wise and that you need support and encouragement, your friends and colleagues may step up and surprise you. They may also have ideas about effective networking. Assess your assets and liabilities as well as your fixed and variable monthly expenses in order to draw up a realistic budget. In concert with this, be honest with your creditors. Pulling a disappearing act will do you no favors. If you foresee problems in meeting your obligations, let them know upfront so that they can work with you, provide credit counseling, and explore debt consolidation strategies. In theater – as in life – there’s no such thing as too much rehearsal. Yet even the most practiced production carries no guarantee of a perfect outcome because of all the external factors that can affect it. The best we can do is to identify potential vulnerabilities, consider action steps to mitigate the damage, and hope that should one’s nose suddenly become detached, it won’t travel so far that it can’t be retrieved and re-affixed.